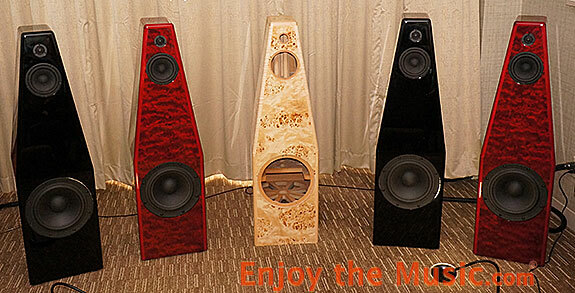 Piraeus Audio's Athena speakers ($23,500) floorstanders have one of the prettiest finishes of any speakers at the CAS 2014 and they have a little secret. This three-way sealed box design mates a smooth sounding 0.75" silk done tweeter with 5" midrange and 10" woofer. So what's the secret you ask? The speaker has digital inputs (yes you read that right!). There are a pair of TosLink optical and RCA coax S/PDIF plus an XLR AES/EBU input. They also come with a massive 750 watts of power per speaker. Piraeus Audio's Athena uses an Analogue Devices SHARC chipset for DSP processing that has an asynchronous sampling rate of 24-bit/192kHz and the crossover is 16th order. This is a 96db/octave digital crossover to be precise. Remember what i said about the cabinet finishes? Well, you have a choice of Bubinga, Walnut, Mappa Burl, Silver Metallic, Piano Gloss Black, and Piano Gloss White. If those aren't quite to your liking, not sure how that could be but.... you can have them made with any custom color or wood veneer of your choice.